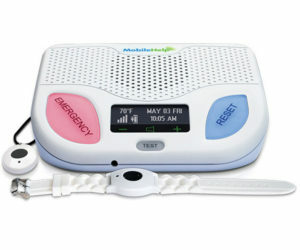 MobileHelp's Award-Winning In-Home Medical Alert Protection is On Sale Now for just $19.95/mo! Hurry! Offer expires April 24! All Systems integrated with nationwide wireless voice, data, & GPS technology for real-time monitoring, location tracking, & emergency assistance across all 50 states. Emergency medical alert system for protection inside the home (no landline required). Lightweight mobile emergency medical system that works inside and outside of the home. Bundles both the Classic and Solo systems for complete protection inside and outside of the home. Fall Detection available with any MobileHelp medical alert system. Free shipping is not available on the monthly plan. Savings off the 1st Billing Cycle Only. This offer is for New Customers Only and cannot be combined with any other offer. Only one discount allowed per order. Prices subject to change without notice. Local taxes may apply. 1Service availability and access/coverage on the AT&T network is not available everywhere and at all times. Fall Button™ does not detect 100% of falls. If able, users should always push their help button when they need assistance. Fall Button™ is not intended to replace a caregiver for users dealing with serious health issues. MobileHelp® is a registered trademark of MobileHelp®. Patented technology. MobileHelp is an FDA registered Medical Device Manufacturer.